"Emma says the mystery of who created the model has still not been solved." All well and good, but today the Plymouth Herald had this to report. 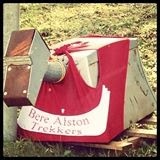 "A METAL dog appears to be at the centre of a tug-of-war between rival villages after he was “stolen” for the second time within a week...This afternoon the dog has once again disappeared from under the Bere Alston sign, prompting fears of a serial dog-napper." They ask that if anyone knows the whereabouts of the poor canine that they should ring the newsroom "in confidence" on 01752 293 123. Or just Tweet them.